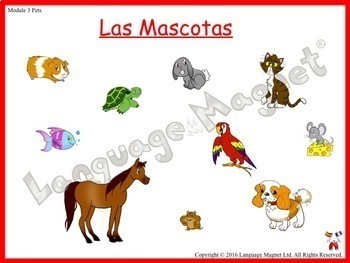 This Spanish pets presentation is a simple and fun introduction to 10 pets and is ideal for beginner Spanish from ages 5 to 12. The presentation in provided with full audio support for easy use by the non-specialist language teacher as well as an MFL specialist. 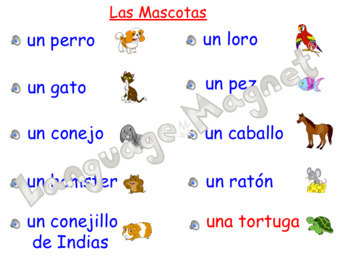 The first 10 slides in the presentation introduce the pets in Spanish and the vocabulary is colour coded in blue and red to show the difference between masculine and feminine nouns. 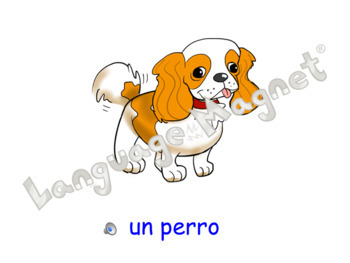 This is followed by a summary slide, which shows the vocabulary and then the pictures on each click, allowing the teacher to assess how well pupils can recall the Spanish pet words. 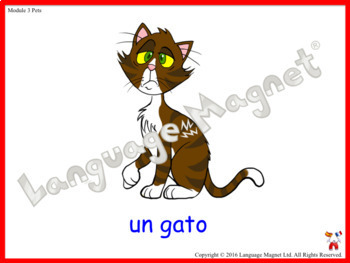 An extra two slides allow the teacher and pupils to extend the pet vocabulary to say a simple sentence about what pet you have. An example is provided, ¿Quién tiene un perro? (Who has a dog?) Yo tengo un perro (I have a dog) followed by a slide showing the question and all the pets. The pictures can be removed to build in more challenge. The presentation also comes with 10 pet display cards and a title card, which can also be laminated and used as physical flashcards for games and speaking activities in the classroom. The audio is Castilian Spanish, the standard form of European Spanish. Please note that the Language Magnet watermark does not appear on your downloaded product. I hope you enjoy using this resource with your pupils and appreciate the quality and uniqueness of my work. If you like this resource, please leave a review for other teachers and visit my shop for more quality products. This Powerpoint presentation and the printable downloads are for use with the teacher’s own classes only and cannot be used by other teachers for other classes unless a multiple licence has been purchased with this product. The original downloads and display cards may not be resold commercially or redistributed.